During her graduate school work, and even earlier, Carol Rowland Hogue recognized how socially and politically fraught issues surrounding women’s and reproductive health had a wide-ranging impact on the health and lives of Americans. Throughout her career, her determination to improve the health and lives of women and children has driven Hogue to conduct groundbreaking research and create programs to prepare the best possible scientists to eliminate the health inequities that lead minority women and children to die prematurely. That passion, a commitment to interdisciplinary collaboration, a dedication to education and mentorship, and an impressive history of research are a few of the reasons Hogue is the recipient of the 2017 Thomas Jefferson Award, which honors a member of the Emory faculty or staff for significant service to the university through personal activities, influence and leadership. 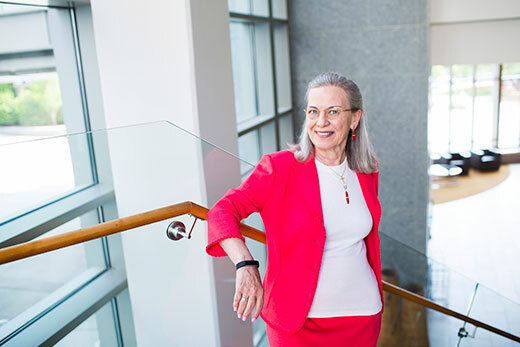 Emory’s Rollins School of Public Health (RSPH) recruited Hogue in 1992 from the U.S. Centers for Disease Control and Prevention, where — as the division director of Reproductive Health — she pioneered the first epidemiologic surveillance of maternal morbidities and innovative research on racial disparities in preterm delivery. Hogue was named the Jules and Uldeen Terry Chair in Maternal and Child Health, the first endowed professorship awarded at RSPH, where she established and has led the Women’s and Children’s Center for the past 25 years. Holding joint appointments in the School of Medicine, Emory College and RSPH, Hogue has served on Emory’s Faculty Council, the provost’s Faculty Advisory Committee and the Faculty Advisory Committee of the Laney Graduate School. When the Board of Trustees invited faculty to serve as counselors, Hogue was among the first chosen. Among many honors, she served as president of both the Society for Epidemiologic Research and the American College of Epidemiology, and in 2016 she received the MCH Epidemiology Coalition’s Greg Alexander Award for Advancing Knowledge —Advancing Public Health through Epidemiology and Applied Research. Hogue’s contributions to public health began well before Emory. She was an assistant professor of biostatistics at the University of North Carolina-Chapel Hill and an associate professor and director of the epidemiology program at University of Arkansas for Medical Sciences in Little Rock before she took a position as a visiting scientist in the CDC’s Pregnancy Epidemiology Branch in 1981. That six-month opportunity turned into a 10-year career beginning in 1982, including positions as director of the Pregnancy Epidemiology Branch and as director of the CDC’s Division of Reproductive Health and a corresponding role as an adjunct professor at RSPH. Michael R Kramer 97AH 09PhD, assistant professor of epidemiology at RSPH, was a clinical physician assistant interested in public health when he attended the annual meeting of the American Public Health Association in 2003. There he heard a talk by Richard David, a professor of pediatrics at University of Illinois-Chicago, about ground-breaking work in the scientific study of racism as cause of racial disparities in maternal health outcomes. One of the two experts whose work David cited was Hogue. Hogue served as Kramer’s dissertation adviser and the two have collaborated on more than two dozen papers since Kramer joined the RSPH faculty. “I think one of the things that seems clear to her is how a place like Emory could make a real impact by creating high-quality training programs for professionals in maternal-child health. RSPH had one of the first CDC-funded MCH certificate programs and she wrote the HRSA (Health Resources and Services Administration) PhD training grant I work now direct," Kramer says. "Carol does all of these things with the idea of really preparing a workforce that can engage in high-level thinking about the real-world problems of high-risk women and families," he continues. "That has been one of her big visions and contributions at Emory." At Emory, Hogue has been an active proponent of interdisciplinary efforts. She was a member of the Templeton Foundation, sponsored faculty dialogues on science and religion, a Gustafson Scholar, and a Senior Fellow of the Emory Center for the Study of Law and Religion. Hogue was a co-chair and now serves as a member of the executive committee of the Religion and Public Health Collaborative, which has built on Emory’s unique strengths in these areas. Ellen Idler came to Emory in 2009 as director of the Religion and Public Health Collaborative; she is a Samuel Candler Dobbs Professor in the Department of Sociology and holds a joint appointment in the Department of Epidemiology at RSPH. “Carol was absolutely instrumental in the background and formation of that unusual alliance between public health and religion that led to a key strategic initiative and the programs we have today, including the dual degree in public health and theology,” Idler says. “The two schools [RSPH and Candler School of Theology], which are often strangers at other universities, are partners here at Emory. That is important because so many things in public health are impacted by faith-based organizations. Keeping the focus on health, rather than politics, is crucial to progress. “Oftentimes the political ramifications of family planning have gotten in the way of recognizing that planned families are healthier families,” Hogue says. Lauren Christiansen-Lindquist 09MPH 15PhD is a maternal and child health researcher and deputy director of the Center of Excellence in Maternal and Child Health Education, Science and Practice, of which Hogue is director. She also has worked with Hogue both as a PhD advisee and since joining the RSPH faculty in 2015. Hogue "is really an outstanding mentor and she really invests a lot of time in the students and colleague she works with. It is important to her that they are successful and she invests the time to make sure that happens. She really helped to shape the direction my research career took,” says Christiansen-Lindquist, who started out with an interest in studying STDs and HIV, then switched to studying the causes of stillbirth and improving the quality of data collected surrounding stillbirths in the U.S. on Hogue’s recommendation. Hogue also has been instrumental in the creation of a certificate program in Maternal and Child Health at RSPH, a program she championed at the request of students who came to her asking for a program. Hogue says her life’s work boils down to one desire. “I continue to be interested in ensuring that couples have the pregnancies they want, when they want them; that they don’t have the pregnancies they don’t want; and they have as healthy pregnancies as possible,” she says.